Create cool seating accommodations by installing these single and double sided contour benches with integrated arched shade canopy top. Offering mild sun protection and engineered for high volume use, it's easy to understand why they're a favored addition for town squares, parks, playgrounds, schools and home owners associations. The convenient design these fixed canopies features MIG welded dual post frame constructed with 4" square structural steel and finished in an impact, weather resistant powder-coating. 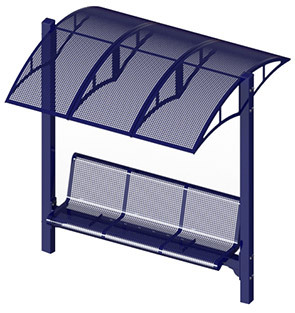 The canopy tops and contour bench seat assemblies are available with a diamond or perforated pattern steel and are finished with a durable polyethylene offered in a variety of popular color options.